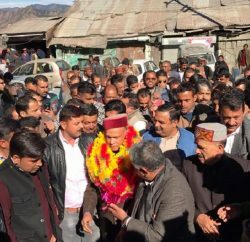 Himachal Pradesh Chief Minister Prof. Prem Kumar Dhumal said that present UPA Government at the Centre was discriminating against the BJP ruled States in the matter of devolution of funds for development which was unfortunate and also against the unitary spirit of Constitution. Chief Minister was speaking in two day long conference of BJP ruled States at New Delhi today. 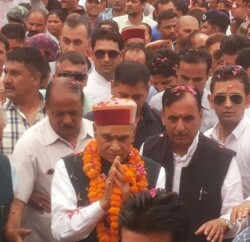 Prof. Prem Kumar Dhumal said that industrial package given to Himachal Pradesh and Uttrakhand by the then NDA Government headed by Shri Atal Behari Vajpayee is discontinued by the UPA Government before its due date and on the other hand for Jammu and Kashmir and North Eastern States industrial package had been extended by it which showed its discriminatory attitude. He said that for Jammu and Kashmir, the Central Government had sanctioned the financial package of Rs. 8000 crore and on the other hand, Himachal Pradesh was declined to raise loan even as per norms set forth by the Planning Commission. He said that as per norms Himachal Pradesh could have raised loans amounting to Rs. 2034 crore but the Union Finance Ministry unilaterally fixed it at Rs. 1647crore. Chief Minister said that Himachal Pradesh was getting only 2.5 percent share in Bhakra Dam against legitimate share of 7.19 percent whereas from Beas Satluj Link Projects, it was getting only 15 MW of power that also as ad hoc. From Pong Dam, the State was not getting any power which was injustice with the State as thousands of families have been dislocated due to construction of these projects and they have not been rehabilitated till today. Prof. Prem Kumar Dhumal said that under various centrally sponsored schemes, the Central assistance was being given in the ratio of 90:10 to North Eastern States whereas Himachal Pradesh and Uttrakhand was giving in 75:25 ratio whereas the socio-economic and geographical conditions of Himachal Pradesh and Uttrakhand were also similar to North Eastern States. Chief Minister said that Himachal Pradesh got least financial assistance on the recommendations of 13th Finance Commission. He said that Commission had estimated only 2 percent annual increase on salaries which was also not realistic and State had to suffer a great loss. He said that the State Government had taken up this matter with the Prime Minister, Finance Minister and Planning Commission but of no use. 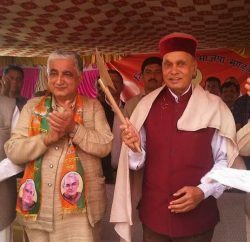 Prof. Prem Kumar Dhumal also said that Himachal Pradesh had also been overlooked in respect of expansion of railway network in the State. He said that though the decision was taken to construct Bhanupalli-Bilaspur-Beri railway line on 75:25 sharing basis in 2007 but due to lukewarm attitude of Central Government in this project, the construction cost has increased from Rs. 1000 crore to Rs. 3000 crore. Not only this, railway ministry has refused to fulfill its commitment. He said that various other railway projects like Nangal-Talwara were also hanging in fire due to shortage of budget.